The Dev channel has been updated to 53.0.2785.36 (Platform version: 8530.35.0) for all Chrome OS devices. This build contains a number of bug fixes, security updates and feature enhancements. A list of changes can be found here. This entry was posted in Google Chrome Releases and tagged Chrome OS, Dev updates, Google Chrome on July 30, 2016 by Ketaki Deshpande. Did you know that AdMob serves ads to more than two hundred countries and territories? To celebrate, The Mobile Ads Garage presents Episode 8 in two languages! Katie from the Mobile Ads SDK team stops by to help Andrew talk about rewarded video mediation. You'll hear the basics of how and why to use AdMob mediation and the Mobile Ads SDK to show rewarded video ads in both English and Chinese. Rewarded video is a full-screen ad format in which users watch ads in exchange for something, typically an in-game reward. Because users hold the power of choice, they don't have to see ads they aren't interested in. Plus, publishers can build the view/reward cycle into the mechanics of their games, creating monetization strategies that actually increase user engagement. When you add all that to AdMob's ability to automatically prioritize mediated networks by eCPM, you've got a complete solution. This entry was posted in Ads Developer Blog on July 29, 2016 by Google Ads Developer Advisor. Just open the app, enter a destination, tap the corner menu, and then tap “Add stop." This entry was posted in Google LatLong Blog and tagged LatLong, Maps on July 29, 2016 by Aditya Dhanrajani. With many people looking to sneak one more getaway into their summer plans, we’ve launched multi-stop directions for Google Maps on iOS (already available on Android). Here’s how it works: Just open the app, enter a destination, tap the corner menu, and then tap “Add stop”. To rearrange the order of your stops, tap and hold the stop you want to move and drag it to the position you want. Once you’ve added all your stops, tap “Done” and your multi-stop route is complete. When you enter navigation mode you’ll have the same seamless driving experience you’re used to, whether you’re going from errand to errand or hitting scenic spots along Route 66. This entry was posted in Google LatLong Blog and tagged LatLong on July 29, 2016 by Lat Long. This entry was posted in Online Security Blog and tagged Security on July 29, 2016 by Google Security PR. This entry was posted in Google and Your Business and tagged AdWords, Adwords Express, Business, Google AdWords, Google+, Tips on July 29, 2016 by Google Small Business. Google Code-in is our annual contest to help pre-university students gain real-world computer science experience by taking on tasks of varying difficulty levels with the help of volunteer mentors. These tasks are created by open source projects so while learning, the students are contributing to the software many of us use on a daily basis. The finalists and winners for our 2015/2016 season were announced in February and, in June, the grand prize winners joined us for four days of learning and celebration. Students and their guardians came from all around the world. One of my favorite things, as one of the Googler hosts, was seeing the light bulbs go on above parents’ heads as they came to understand open source and why it’s so important. These parents and guardians were even more proud of the students as they learned how much their teenager has contributed to the world through participating in Google Code-in. We’ve invited contest winners and organizations to write about their experience and will be sharing their stories in a series of blog posts. This marks the first post in the series. Let’s start with Jason Wong, a student from the US who worked with FOSSASIA. FOSSASIA supports open source developers in Asia through events and coding programs. He learned about Google Code-in when Stephanie Taylor, fellow open source program manager who manages the GCI program here at Google, gave a talk at his school. Jason dove right in picking FOSSASIA as the project he would contribute to. Next up we have Hannah Pan, another US student. She chose to work on Haiku, an open source operating system built for personal computers, because it used the C/C++ language which she was already confident with. Hannah got into computer science through a high school AP course and discovered Google Code-in through this blog (woohoo!). She decided to participate even though it had already been underway for two weeks. Aiming just to make the top 10 in order to have a chance at being a finalist (and earn a hoodie), Hannah finished as a grand prize winner! The learning curve was steep: *nix commands, build tools and GitHub all presented new challenges. She was surprised how much code she had to sift through sometimes just to isolate the cause of minor bugs. Thank you to Jason and Hannah both for contributing to open source and sharing their Google Code-in experiences with us. Stay tuned as we continue this series in our next blog post! This entry was posted in Open Source Blog and tagged FOSSASIA, gci, Haiku, Open source, student programs, students on July 29, 2016 by Open Source Programs Office. Last year, we published a guide for our customers who had familiarity and expertise with AWS but wanted to learn how it compares to Google Cloud Platform. The guide had a really positive reception, helping customers understand things like how Cloud Platform delivers Infrastructure as a Service with Google Compute Engine and how our VPN works. Today, we're happy to announce a major expansion to the Cloud Platform for AWS Professionals guide, with new sections covering Big Data services, Storage services and Containers as a Service (Google Container Engine). As we said last year, this guide is a work-in-progress. We have some ideas about what topics we’d like to tackle next (services like Databases and Development tools) but we’d also love to hear what you think we should cover. We hope you find this information useful and makes learning about Cloud Platform enjoyable. Please tell us what you think, and be sure to sign up for a free trial! 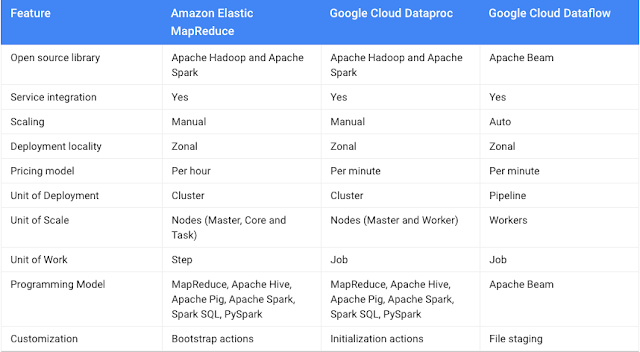 This entry was posted in Google Cloud Platform Blog and tagged Google Cloud Platform on July 29, 2016 by GCP Team. Episode eight of The Mobile Ads Garage is live on YouTube! If you haven't seen it before, The Mobile Ads Garage is a video tutorial series that covers how to use the Mobile Ads SDK to display ads from AdMob and Doubleclick For Publishers. Each episode covers one aspect of the SDK, breaks down the feature, and shows screencasts of real implementations on both Android and iOS – all in a friendly format. This entry was posted in AdMob Blog and tagged AdMob Mediation, Android, ios, Mobile Ads SDK, Rewarded Video Ads on July 29, 2016 by Chris Jones. Explore the "Marvelous City" and its rich cultural heritage in an interactive online collection of some of the city’s most famous art exhibits and landmarks. This entry was posted in Google LatLong Blog and tagged Arts & Culture, Google VR, LatLong, Maps on July 29, 2016 by Alessandro Germano.